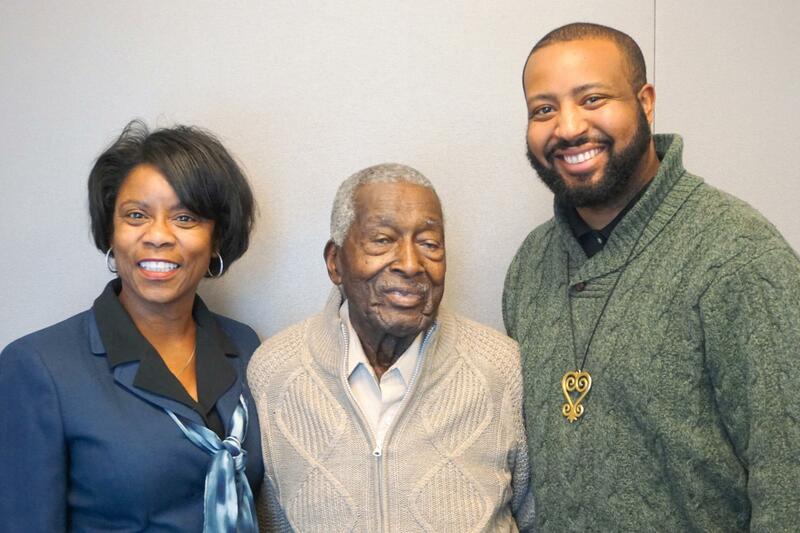 (L-R) Kim Chamberlain, Marshall J. Phillips and Marvin-Alonzo Greer shared some experiences of African-Americans in the U.S. military on Wednesday's "St. Louis on the Air." On Wednesday’s St. Louis on the Air, host Don Marsh talked about the contributions and enduring legacies of African-American doughboys who served in World War I. The topic will also be the subject of a panel discussion Sunday at the Soldiers Memorial Military Museum in downtown St. Louis. Joining the Wednesday’s discussion were Marshall J. Phillips, a 100-year-old World War II veteran; Kim Chamberlain, a U.S. Air Force veteran; and Marvin-Alonzo Greer, the education and visitor experience lead for Soldiers Memorial Military Museum. Phillips and Chamberlain, who will both play a role in the weekend event, shared some of their experiences in the military with Marsh and listeners – and also described how they overcame some of the challenges they faced. Greer explained that Sunday’s event came together as a way to showcase soldiers coming home from World War I in 1919 – and beyond. “And [it’s] to really continue this discussion of the First World War and the legacy that black soldiers played up in post-war years: of how they built communities here in St. Louis, how they built communities throughout the country and the legacies that they left for future African-Americans serving in future generations of future wars,” he added. Despite the racism the black soldiers faced at home, they fought to defend the United States. Listen for the full conversation and to hear more about the experiences of veterans Kim Chamberlain and Marshall J. Phillips.